Posted on November 6, 2007 under Travel, Treks. We decided to trek to Z-point in the morning. Z-point is on the top of a hill, from where you can get an magnificent view of the valley below. The trail is an easy one and a short 10-20 minute trek. We started along this trail at about 9:00 in the morning. The trail initially passes through some forest and then weaves it’s way up through the hills. Along the way you pass a small waterfall called “Shanti Falls”. Many people head up here to have a dip in the icy cold waters of the fall. After traversing the narrow meandering path up the hill, you finally reach Z-point. The view from here is absolutely amazing, you can see for miles and miles around. After spending some time here we came back to the guest house. An added bonus of this little excursion was the Paradise Flycatcher that we briefly spotted flying into the treetops. On coming back to the guesthouse, we started checking for leeches, which are quite common in these areas. And sure enough, I found one having it’s lunch at my expense. Luckily, I had come prepared with antiseptic and some lime to ward off the leeches. After this though we were doubly careful to check for leeches while walking. After lunch we decided to take a walk around the gardens. During the walk we spotted a Common Hoopoe in the gardens along with wagtails, crows, pigeons, bulbuls, mynahs and other common birds. The sky was getting pretty dark at this point and it looked like it would rain. So we quickly headed indoors. Sometime later in the evening it rained very heavily there, forcing us to spend a majority of the evening indoors. 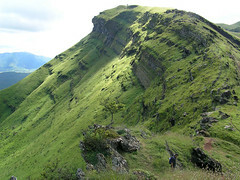 This entry was tagged under: Kemmangundi, Travel, Trekking. Both comments and pings are currently closed.